L to R Dan Beck, Chet Dunn DS17, Parks (construction foreman). "Molding concrete blocks for our buildings. 1917." 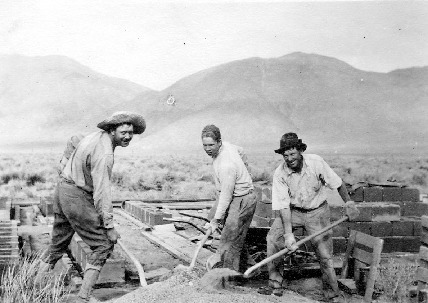 unknown, “Making concrete blocks for the buildings,” Deep Springs Archive, accessed April 21, 2019, http://archive.deepsprings.edu/items/show/1213.